Gain: Unity Frequency Response: 2.5 Hz to 15MHz to /-dB Bandwidth (-3dB): 1Hz to 15MHz. Unit has four individual video amplifiers providing four equal video outputs. Receives a single input signal, isolates and then provides four independent video outputs. 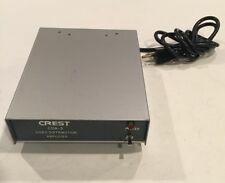 The IOCrest SY-ADA31048 YPbPr RCA Audio to HDMI convertor device converts YPbPr input into HDMI 1.3a and allows PC users to enjoy their larger images and videos on their desired display. Additionally, L/R analog audio is added to the HDMI stream. It is ideal for users with a need to connect laptops or PC's to newer HD monitors and projectors. Converts VGA Source to HDMI Display. Supports Audio Function for HDMI Monitor and TV. HDMI/ HDCP Compliant. We aim to earn each of our sales, and work hard to hold a high standard. LED Indicators for Power and Activity. IO Crest VGA to HDMI Converter w/Audio Support - SY-ADA31025 Converts VGA Source to HDMI Display Supports Audio Function for HDMI Monitor and TV HDMI/ HDCP Compliant LED Indicators for Power and Activity Powered by USB Port Cable Length: 8" IO Crest VGA to HDMI Converter w/Audio Support - SY-ADA31025 - Free Shipping Up for sale is the IO Crest VGA to HDMI Converter w/Audio Support - SY-ADA31025. All of these items are opened box items, see description above. All have been tested and found to be in working order and practically brand new condition prior to being offered for sale unless otherwise noted above. SYBA SY-ADA31025 VGA to HDMI Converter with Audio Support. Built-in Audio, USB Powered, Support 1920x1080. Enjoy better display quality on new LED monitor and TV. Save energy too. Converts VGA Source to HDMI Display. IO Crest Mini Displayport Male to VGA Female Adapter - Mini DisplayPort/VGA for. Connector on First End: 1 x Mini DisplayPort Male DisplayPort 1.2 Digital Audio/Video. This DisplayPort to VGA adapter allows you to keep your legacy peripherals up-to-date. This converter is NOT bi-directional. It only converts from VGA to HDMI. Conductor Copper. Connector on Second End 1 x 15-pin HD-15 Male VGA,1 x Type A Male USB,1 x Mini-phone Male Audio. Connector on First End 1 x HDMI Female Digital Audio/Video. HDMI Receiver compliant with HDMI 1.4 specification. Analog RGB output for VGA with Triple 9-bit DAC up to 200MHz pixel rate. Sync signals can be provided in separated or composite manner. Support VESA and CEA timing standards up to WUXGA 1920x1200at60Hz and 1920x1080at60Hz. Convert HDMI signals into VGA outputs at a maximum conversion rate of 200 MHz with IIS or SPDIF audio output. The HDMI Receiver integrated is compliant with HDMI 1.4b. The DACs are based on current source architecture. Supports HDMI Standard Norm. Complaint with HDMI 1.4 specification. Analog RGB output for VGA with Triple 9-bit DAC up to 200MHz pixel rate. Supports VESA and CEA timing standards up to WUXGA 1920x1200at60MHz and 1920x1080at60MHz. Syba IO Crest Active Mini HDMI Male to VGA Female Adapter (SY-ADA31046) Condition is New. Shipped with USPS First Class Package. Used for converting flat 300 Ohm TV cable to 75 Ohm Plug into TV antenna input. CREST XPC171B-5 Video Male to Male RF. 1 x CREST XPC171B-5 Video Male to Male RF. Specifications are subject to change without notice. While every attempt has been made by RepoGuys in the production of these specifications, possible errors or omissions may still occur. Used for adapting from RCA to SVHS plug type. Transfer signal from S-video to composite RCA only. Style:Syba VGA to HDMI SYBA SY-ADA31025 VGA to HDMI Converter with Audio Support. Built-in Audio, USB Powered, Support 1920x1080. Enjoy better display quality on new LED monitor and TV. Save energy too. IOCrest 1080P VGA to HDMI Audio Video Cable Converter Active Output Adapter for HDTV/AV, Audio Support, Adapter for PC, Laptop, DVD, Desktop - SY-ADA31025. Built-in Audio, USB Powered, Support 1920x1080. Trending at $18.46eBay determines this price through a machine learned model of the product's sale prices within the last 90 days. Active Output 1080P VGA to HDMI Audio Video Cable Converter Adapter for HDTV/AV, Audio Support, Adapter for PC, Laptop, DVD, Desktop. Built-in Audio, USB Powered, Support 1920x1080. Enjoy better display quality on new LED monitor and TV. The I Crest SY-ADA31049 Yapper RCA Audio to HDMI convertor device converts Yapper input into HDMI 1.3a and allows PC users to enjoy their larger images and videos on their desired display. Converts Analog Componenet video and Stereo audio signals Input to Digital HDMI 1.3 Output. Audio Output: SPDIF, COAXIAL, 3.5(L/R). Input Resolution: up to 1080p 50/60Hz. Supported Video Color Format: 24bit, 30bit, 36bit. Product Specifications. Active Output 1080P VGA to HDMI Audio Video Cable Converter Adapter for HDTV/AV, Support, PC, Laptop, DVD, Desktop. SYBA SY-ADA31025 VGA to HDMI Converter with Audio Support. Built-in Audio, USB Powered, Support 1920x1080. Style:VGA 3.5mm to HDMI This VGA & Audio to HDMI converter allows users to duplicate their PC's image from their monitor to large HDTVs. 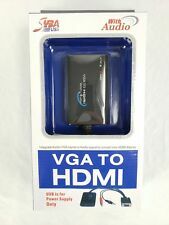 Convert VGA video and R/L audio into HDMI. Video Output: HDMI HDCP1.0/1.1. 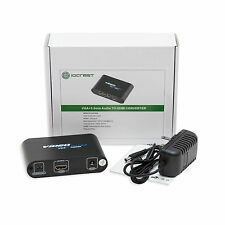 IO Crest SY-ADA31063 HDMI to VGA Adapter with Sound 1080P 1.4b convert HDMI Compatible with HDMI 1.4b input. This mini adapter transports audio and video at the same time. Attached Micro-USB cable provides additional power for devices with low-power outputOutputs: VGA and 3.5mm AudioClearly labeled on all connectors Compatible with Google ChromecastExplore EP94Z1E Chipset Plug-and-PlayUSB power cable (Type-A to Micro USB) and 3.5mm Audio Cables Included. 3.5mm audio port can connect to speaker, headphone, amplifier and other device IO Crest SY-ADA31063 HDMI to VGA Adapter with Sound 1080P 1.4b convert HDMI This mini adapter offers a convenient and reliable solution for connecting an HDMI source device to a monitor or projector with VGA port. Connect your HDMI-equipped system to your legacy peripheral. IOCrest 1080P VGA to HDMI Audio Video Cable Converter Active Output Adapter for HDTV/AV, Audio Support, Adapter for PC, Laptop, DVD, Desktop - SY-ADA31025. SYBA SY-ADA31025 VGA to HDMI Converter with Audio Support. 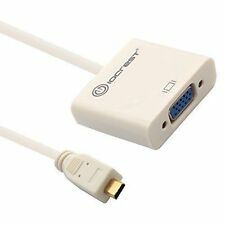 IOCrest 1080P VGA to HDMI Audio Video Cable Converter Active Output Adapter for HDTV/AV, Support, PC, Laptop, DVD, Desktop - SY-ADA31025. Converts VGA Source to HDMI Display. Supports Audio Function for HDMI Monitor and TV. IOCrest 1080P VGA to HDMI Audio Video Cable Converter Active Output Adapter for HDTV/AV, Support, PC, Laptop, DVD, Desktop - SY-ADA31025. SYBA SY-ADA31025 VGA to HDMI Converter with Audio Support. Built-in Audio, USB Powered, Support 1920x1080. The device is plug-and-play, it will automatically sense the native resolution of the display and scale the computer's output to match it. The converter will take audio signal from the computer and embedded it into the HDMI signal output, so that the user is able to enjoy both audio and video through a single cable. SYBA VGA to HDMI Video & Audio Converter Output Computer Screen, Movie, and Game Converts VGA signal and 3.5mm audio source, through a HDMI cable, output to big screen TV and projectorThis video / audio adapter is powered by USB port. Simple plug and play design. No driver installationEasy to carry mini size. Design for traveler and business man. Output computer movie and play PC game on big LED/LCD TV1920x1080 24-bit color, HDCP, LED Indicators for Power and Activity1 VGA Input (DB-15), 1 Stereo Input (3.5mm), 1 USB Power Cable (Type-A), 1 HDMI Output SYBA VGA to HDMI Video Audio Converter Output Computer Screen, Movie, and Game on TV Projector SD-ADA31040 This is an integrated VGA audio to HDMI converter. Allows you to enjoy your games, movies, and other media on your HDTV with a High quality trans. Style:Syba VGA to HDMI. SYBA SY-ADA31025 VGA to HDMI Converter with Audio Support. Built-in Audio, USB Powered, Support 1920x1080. Enjoy better display quality on new LED monitor and TV. Save energy too. Active Output 1080P VGA to HDMI Audio Video Cable Converter Adapter for HDTV/AV, Audio Support, Adapter for PC, Laptop, DVD, Desktop. SYBA SY-ADA31025 VGA to HDMI Converter with Audio Support. Built-in Audio, USB Powered, Support 1920x1080. SYBA Universal VGA to HDMI Converter with Audio Support, Adapter for PC, Laptop, Converts VGA Source to HDMI DisplaySupports Audio Function for HDMI Monitor and TVHDMI/ HDCP CompliantLED Indicators for Power and ActivityPowered by USB PortCable Length: 8" SYBA Universal VGA to HDMI Converter with Audio Support, Adapter for PC, Laptop, DVD, Desktop, SY-ADA31025 SYBA SY-ADA31025 VGA to HDMI Converter with Audio Support. Built-in Audio, USB Powered, Support 1920x1080. Enjoy better display quality on new LED monitor and TV. Save energy too . SYBA Universal VGA to HDMI Converter with Audio Support, Adapter for PC, Laptop, DVD, Desktop, SY-ADA31025. SYBA SY-ADA31025 VGA to HDMI Converter with Audio Support. Built-in Audio, USB Powered, Support 1920x1080.